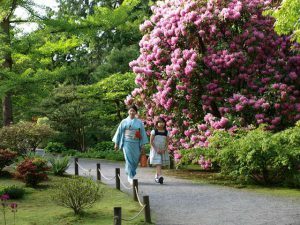 On Monday, January 11, in a historic vote, the Seattle City Council unanimously approved legislation transferring the support role for the Seattle Japanese Garden from the Associated Recreation Council (ARC) to the Arboretum Foundation. Foundation Executive Director Paige Miller signed a formal, five-year agreement with Seattle Parks and Recreation on Thursday, January 14. 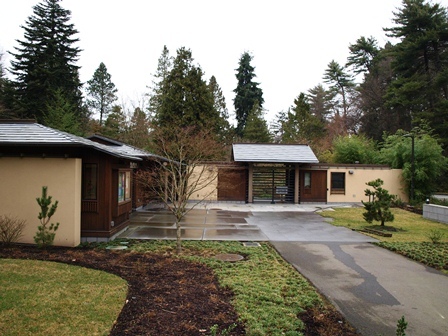 The Foundation will assume management of fundraising, events, volunteer recruitment, membership, and marketing for the Japanese Garden; Seattle Parks and Recreation will continue managing the maintenance and upkeep of the grounds and plant collection. The Arboretum Foundation has deep-rooted ties to the Seattle Japanese Garden. The Foundation’s interest in creating a Japanese garden in the Arboretum began in 1937. Funds were raised, but World War II halted our efforts. 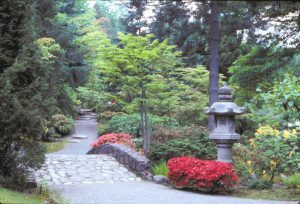 In the late 1950s, the Foundation raised the funds for the creation of the Seattle Japanese Garden at its current site and secured the designers from Tokyo. The Garden opened in 1960, and over the decades, the Foundation has helped raised money for renovations and capital projects. Our Foundation’s volunteer Unit 86 was formed in 1966 to recruit and train the Japanese Garden’s tour guides and to be the main volunteer group for the cycle of cultural events held in the Garden—all of which they still do today. In 2007, we helped raise private funds to match with Pro Parks Levy money to build the Entry Gatehouse at the Japanese Garden. We provided the accounting and bookkeeping, as well as grant-writing, marketing, and other support, for this successful campaign that raised about $1 million. The new Japanese Garden Gatehouse, opened in 2009. In recent years, ARC has partnered with Seattle Parks at the Japanese Garden and has done an admirable job in the major support role. However, ARC’s primary focus is on providing programming at Parks Department recreation facilities and community centers—rather than on supporting specialty gardens. Early last year, Seattle Parks undertook a formal review of the Japanese Garden’s management structure and determined that it was in the long-term interest of the Garden to find a more suitable support partner. Last summer, the Foundation was thrilled to be asked by Seattle Parks and Recreation Superintendent Jesús Aguirre to consider taking on the major support role for the Japanese Garden. Our Board of Directors carried out a thorough study of what it would mean for the Foundation to take on this added responsibility, and we determined that it would be a great opportunity for both the Foundation and the Garden. The Foundation will be responsible for events, fundraising, volunteer recruitment, and more. The board of ARC and the Japanese Garden Advisory Council have voted fully in support of the transition. As part of the agreement with Seattle Parks, the Japanese Garden’s Events and Stewardship Coordinator Rumi Tsuchihashi—currently employed by ARC—will become a staff member of the Arboretum Foundation. Our Board of Directors is also forming a new Japanese Garden Committee to oversee Garden matters. It will be made up of board members with strong ties to the Japanese Garden. Steve Alley, the current president of the Advisory Council, which will now be dissolved, has just joined our board. Our thanks to the many people who helped bring about this transition, including Bill Keller at ARC and our board members Diane Adachi, Terry Holme, and Roger Williams, all three of whom spoke before Council this week. Special thanks to the City Council, in particular to Sally Bagshaw for presenting the measure.